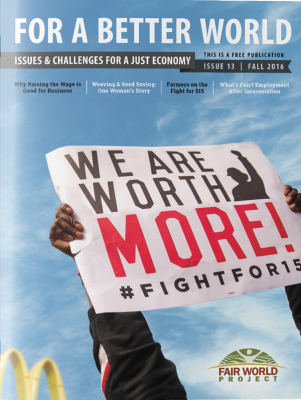 We advocate for dignified pay and working conditions for workers globally. Too often the people who produce our food and apparel are exploited. Fair World Project advocates for dignified pay and working conditions for workers globally who are too often marginalized and exploited. 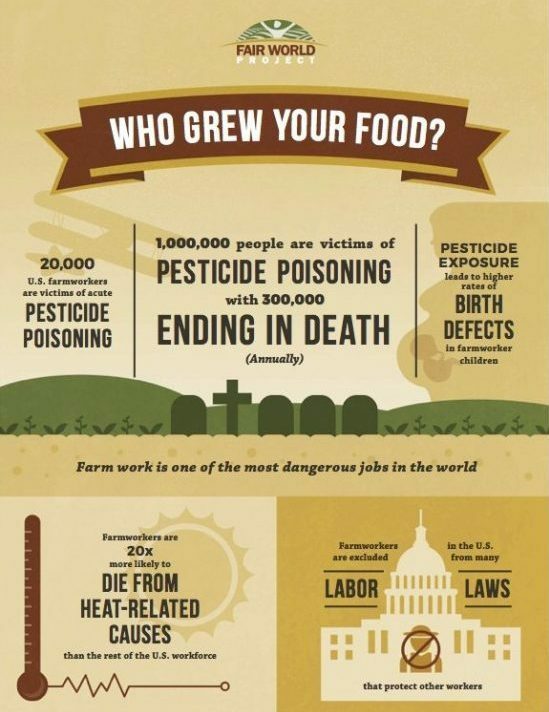 Agricultural work is some of the most dangerous work in the world. Farmworkers who plant, tend, and harvest our food and fiber crops are too often exposed to pesticides and other toxins, vulnerable to heat-related illness, and at risk of injuries and accidents at rates greater than most workers. And the vulnerability doesn’t stop at the farm gate. Food workers in the U.S. earn low wages and are at high risk for accidents and injury. Many people who work in the food system are themselves food insecure. Food workers also face high levels of racism, discrimination, and sexual harassment. Apparel supply chains are complex. To turn cotton into a t-shirt can takes many steps including ginning, spinning, weaving or knitting, and cutting and sewing. Many hands are needed to produce apparel and significant human rights violations and deep poverty mark most apparel supply chains. 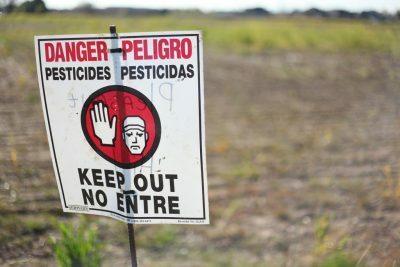 The Agricultural Worker Protection Standards are the EPA’s regulations that aim to reduce pesticide exposure among farmworkers and others who handle toxic chemicals. Although ideally we want to reduce and eliminate the use of these toxins, in the short term, we need to protect the workers who are required to handle them. These standards are now under threat. Let your Senators know you support strong pesticide regulation. 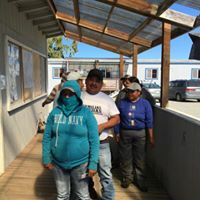 Familias Unidas por la Justicia was locked in a four-year labor dispute with Sakuma Brothers Farm, a large berry farm in Washington that supplies berries to Driscoll’s among others. They were fighting for the right to be recognized as a union and to collectively bargain. When they asked for Fair World Project’s help, over 10,000 consumers in our network signed a petition to Driscoll’s asking them to intervene. Fair World Project helped facilitate dialogue among Driscoll’s, Sakuma, and FUJ, and after two years FUJ was finally recognized as a union and started the 2017 season with a union contract. Read more of FUJ’s story. U.S. trade policy has restructured the global economy, forcing changed migration patterns and variable economic opportunities. Yet our immigration policy hasn’t kept up with changing needs, especially for sectors like the food system that rely on immigrant labor. 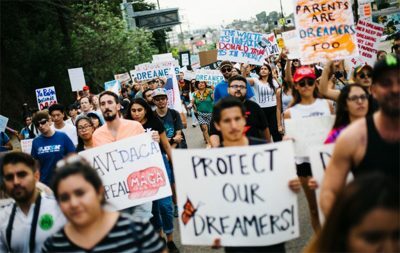 We facilitated thousands of leaders on behalf of the Dreamers—children brought to the U.S. by immigrant parents, and continue to fight for fair trade and immigration policies that meet the needs of working families and a sustainable food and agriculture system. Major retailers like Safeway, Trade Joe’s, and Kroger are talking more and more about sustainability but have yet to include farmworker justice as a core part of their business model or sustainability plan. Thousands of consumers sent letters to these retailers asking them to be leaders on farmworker justice. We continue to advocate for farmworker justice and encourage all farms, brands, and retailers to make this a priority. Read our Who Grew My Food fact sheet to learn more and get involved. For International Food Workers Week 2013, nearly 5,000 people signed our pledge to stand in solidarity with Walmart employees and the workers and farmers who supply them, in the face of chronic mistreatment and unfair payment by Walmart. 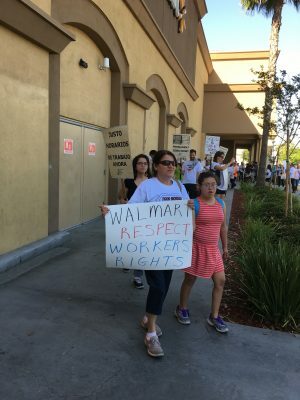 Since then, Walmart has shown some hope for improvement by signing the Coalition of Immokalee Workers’ Fair Food agreement, but that only helps workers in one supply chain. We continue to work within the Food Chain Workers Alliance and with other allies to advocate for more widespread change at this mega retailer. The EPA has all the information it needs to ban chlorpyrifos and other toxic pesticides like it and a bill was introduced into Senate to do just that. FWP facilitated over 7500 letters in support of this ban and will continue to advocate for a less toxic, more just food system and the prohibition of chlorpyrifos and other pesticides like it.